The petrolheads among you may well have cringed at seeing a guide for the best driving experiences, all too aware of overpriced gift vouchers giving the lucky recipient five rev-limited minutes around an airfield in a leggy red supercar well past its best. But fear not, because T3 has dug a little deeper to find a whole range of driving experiences for car lovers to enjoy. Some are cheaper than you might expect and some are, admittedly, rather expensive, but offer genuine, once-in-a-lifetime access to some of the greatest cars you could ever hope to lay your hands on. So grab the GoPro, buckle up and check out our guide to the best driving experiences you can buy today. This experiences sees you slip behind the wheel of a BMW M240i with the traction control firmly switched off. After a demonstration by an instructor, you’ll be given an hour of one-on-one coaching as you work to master Goodwood’s skid pan, performing heroic powerslides, drifts and J-turns, before returning to the paddock for tea, coffee and homemade cookies. At the other end of Goodwood’s scale is the Goodwood Revival Racing Experience, which we think is quite possible the ultimate corporate away day. You’ll get to race your colleagues around the famous Sussex circuit in the kind of Sixties racers featured at the prestigious Goodwood Revival. There are Mini Coopers, Ford Cortinas, an Alfa Romeo GTV, a Porsche 912, and a plucky little Austin A40 for you to enjoy. As well as driving, the event includes breakfast, lunch and afternoon tea, plus prize giving at the end of the day. Time to start nagging the boss. Surrey-based Mercedes-Benz World offers a wide range of driving experiences both on and off road. The one-hour on-road experiences can be had in a range of AMG cars, from the Mercedes-AMG E43 saloon (£190), to the AMG GT R supercar (£570). At £360 we reckon the AMG GT experience is the best value for money, as you get to drive in an AMG saloon for 30 minutes, then spend the remaining half-hour in the 190mph AMG GT. During the hour, you’ll get to try out the handling circuit and skid pan, then go flat-out down the facility’s Dynamic Straight and Wet Dynamic Straight. Afterwards, you can browse the Mercedes-Benz World collection of rare cars, or buy a ticket for the Brooklands vintage motoring and aviation museum across the road. You’ll start the session with three instructor-driven laps in a normal car to get a feel for the 2.4-mile circuit. Next comes three laps driving a mid-engined Porsche Cayman, before jumping into the 199mph Ferrari 458 Spider, one of the greatest supercars ever made. Unlike some experience centres, Thruxton, which happens to be the fastest race track in the UK, doesn’t have stringent speed limits and the circuit isn’t littered with cone chicanes to slow you down. Have you ever considered hiring a car to drive at your leisure, instead of briefly hooning one around a track? Sports car maker Caterham offers such a service, with prices starting from £199. That gets you your own car from 9:30am until 4:00pm on a weekday, and you can cover up to 120 miles. Two-day hire (during the week) with a 240-mile limit costs £299, while a 360-mile weekend (Friday to Monday) is £399, and a 1,000-mile, seven-day week is £799. All prices include insurance and extra miles are charged at a rate of 50p per mile. There is a £500 security deposit to be paid, and drivers must be aged between 25 and 70. 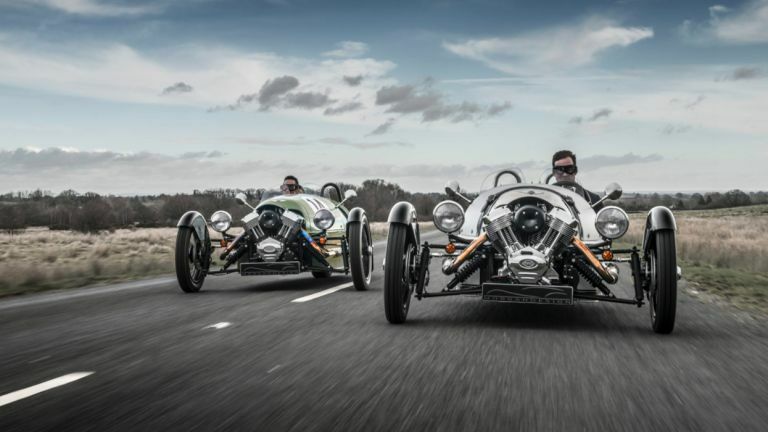 If three wheels is more your thing, then how about borrowing a Morgan 3 Wheeler? This factory-run hire service starts at £220 for a seven-hour day during the week, or you can take the car from Friday morning until Monday morning for £595. Unlike the Caterham offer above, Morgan includes unlimited mileage with every car. Widely regarded as the UK’s ultimate amateur track driving experience, PalmerSport is located at Bedford Autodrome and gives customers the opportunity to drive a wide range of vehicles from a go-kart to a Formula 3000 single-seat racer. Half days cost £594 and a full day, running from 8am to 5:30pm, costs £1,032. For that, guests get to drive PalmerSport’s kart, Land Rover Defender, Caterham, Renault Clio Cup racer, Ariel Atom 3, BMW M4, Palmer JP-LM and a single-seat Formula 3000 car. PalmerSport says its instructors - who are often professional racing drivers - “will encourage you to drive as fast as possible,” which is just what we like to hear. Bedford Autodrome is one thing, but how about driving on the legendary Nurburgring? And we don’t mean the GP circuit; this is the full-fat, 13-mile Nordschleife. For around €30 (£26) a lap you can take your own car around what is essentially a one-way, derestricted German toll road. Or try hiring something more interesting from RSR Nurburg, a company specialising in handing out sports cars for punters to drive around the world’s largest and most notorious racetrack. Prices start at €269 for two laps in a Ford Fiesta ST, one of the very best hot hatches. Alternatively, we’d recommend the quicker, but more sure-footed VW Golf R - a four-wheel-drive hatchback which can be left in automatic to let you concentrate on the ‘ring’s 160 corners. Four laps - including fuel and lap tickets - will set you back €749. Finally, for the driver who has no fear of dealing with German insurance companies, there is a Porsche 911 GT3 RS available for €3,499 for six laps, or €4,999 for 12. Inspired by the launch of the new Land Rover Discovery back in early 2017, this five-day adventure includes three full days of off-road driving through Moab, Utah. The trip includes driving over miles of sand and using the car’s off-road capabilities to scramble up and down Utah’s rocky scenery. The price includes transfers to and from Grand Junction Airport, accommodation at the Red Cliffs Lodge, breakfast, lunch, dinner and drinks with meals. This is an ultra-exclusive event, as Land Rover only takes 16 guests on each trip in eight cars. If you’d like to attend as a couple, the total price is $11,500 (£8,300) and you will share a car for the adventure. If you're looking for something a little closer to home, but just as extreme, why not sign up for Land Rover's Eastnor Explorer, which also teaches you survival skills along the way. Read T3's review of the Eastnor Explorer Experience. And finally...this is the opportunity to drive a real Formula One car. It’s not a butchered old show car with a F3 engine in the back, and it doesn’t have a fun-sapping rev limiter. It’s a genuine F1 car and you get to drive it for three laps around the Barcelona GP circuit. There are a range of F1 cars available, including the Benetton B198 and Jaguar R2 from the Nineties and Noughties. Or, for a little extra (by which we mean, for double the price) a Williams FW33 from 2011, which is claimed to be the most modern F1 car available for amateurs to drive anywhere in the world. The all-day event begins with an in-depth technical briefing of the circuit and cars, followed by a tour of the track to learn your braking points. Next come two sessions in a Formula Renault F3 car, before pausing for lunch then heading out for three laps in an F1 car; more laps can be purchased on the day. Your experience is rounded off by optional passenger laps in a unique three-seat F1 car driven by a professional.